1. An axial (or Y-axis) pressure function found on some tube-bending machines which is similar to the common assist-pressure function but is distinguished from it by applying pressure to both sides of the tube behind the line of tangency. (Assist pressure is applied only to the outside half of the tube at the line of tangency.) Boost pressure pushes the tubing material through the point of bend as it is drawn forward around the bend die, which has the effect of increasing the flow of material from the tangent into the arc. 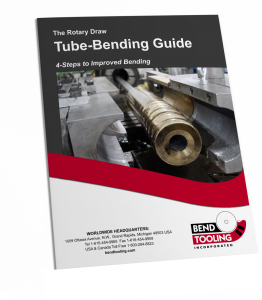 This increased flow is necessary only for tubing materials that do not become readily plastic at the point of bend or when wall thinning of the extrados must be kept to an extreme minimum. Boost pressure is not otherwise recommended because it has the disadvantage of also exacerbating the wall thickening of the intrados. 2. Assist pressure; use of the term is this sense should be avoided to prevent confusion with first definition.